Now, there aren’t many people I would stay up for until 4:30am on a Saturday night, but that’s exactly what I did last Saturday night (15th April 2017). Why was this? It was because Harry Styles was the musical guest on Saturday Night Live, and because of the time difference (it started at 11:30pm in New York), it started at 4:30am in the UK. We had heard rumours that Harry was going to appear in some skits with the host, Jimmy Fallon, and that as well as singing his first solo single, Sign Of The Times, that he would be singing a second song from him upcoming album Harry Styles. So, as you can imagine, we were all very excited! Not only did Harry sing Sign Of The Times and Ever Since New York, he also took part in two sketches: one where he hilariously impersonated Mick Jagger in a time traveller’s edition of Family Feud (where Jimmy Fallon played both a 1977 and a 2017 version of John Travolta! ), but he was also in a sketch set in the Civil War. The feedback from non-One Direction fans has been simply amazing; so many people basically saying “I don’t like One Direction but that Harry guy can sing!” I’m so pleased for him that people are taking off their One Direction-tinted glasses and seeing what we’ve seen for the past seven years; that Harry is a talented guy with a lot more to show. I’ve included a video of Harry on Saturday Night Live below, he was simply amazing. IMDb synopsis: A reporter’s dream of becoming a news anchor is compromised after a one-night stand leaves her stranded in downtown L.A. without a phone, car, ID or money – and only 8 hours to make it to the most important job interview of her life. My verdict: I have to say, I liked it. Reporter Meghan Miles thinks she’s up for promotion, only to find out she’s lost out to Wendy Chang. As well as this blow, her boyfriend has upped and left her. Her friends, Rose and Denise, convince her that she needs a fun night out, and this is pretty much where the film begins. They end up in a bar, where dishy James Marsden is serving the drinks, through a clumsy happenstance (I love that word, I’ve just found out it means something that happens by chance, I’m so dim! ), she ends up going home with James Marsden. She wakes up after an eventful night, and tries to get home. Various things get in the way of that, and she ends up doing the so-so shameful walk of shame, via a crack house, massage parlour and various other randomness. The amount of James Marsden was lacking for me, so a point docked there. Plus, she just leaves her car at the pound. Like, who does that? It’s a rainy weather duvet day kinda film, or if you’re off sick and just need to Netflix and chill. But alone, you’re sick and need your rest. IMDb synopsis: When the world’s media descend on the remote Scottish island where a Hollywood actress is attempting to get married, a local girl is hired as a decoy bride to put the paparazzi off the scent. My verdict: I found this on Netflix as I was looking for David Tennant films to watch to fill the Jessica Jones hole left in my telly viewing. 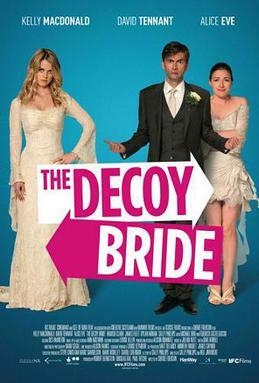 David Tennant plays James Arber, a best-selling author who is due to get married to Hollywood actress, Lara Tyler (played by Alice Eve), except their wedding is ruined when a paparazzi photographer manages to sneak into the church they’re in and Lara calls the wedding off. As they want a paparazzi free wedding, they decide to run off to the island of Hegg in the Outer Hebrides of Scotland (which is a fictional island in real life). Unfortunately, the same paparazzi guy finds out and heads over to Hegg. To try to help them to get married in secret, local girl Katie Nic Aodh (played by Kelly Macdonald, who was 35 in real life in this but looks about 25! ), is drafted in to be the decoy bride, to give the paparazzi their picture, believing they’ll leave, leaving Lara and James in peace to get married. All kinds of craziness take place, including David Tennant dressing up like one of the Bay City Rollers, a deaf couple dancing to bagpipes, a haunted toilet and the man from Ugly Betty being the character he played in Ugly Betty. Hurrah. IMDb synopsis: A former super-hero decides to reboot her life by becoming a private investigator. I’ve never really been into Marvel; not the comics, not the films. So, I was going into this with no super-hero background knowledge. It didn’t matter, as even though it is a Marvel show, my lack of knowledge didn’t detract from the show. * Krysten Ritter plays Jessica Jones, a former super-hero who is now a private detective, trailing cheating husbands and wives around New York City. All she’s trying to do is get rent money and move on with her life, but her past keeps coming back to haunt her. * Rachael Taylor plays her best friend Trish Walker, a former child actor and now talk show radio host. * Jessica has an apartment in the same block as drug addict Malcolm Ducasse, played by Eka Darville, who she takes care of a lot, but later in the series, the tables turn and he ends up looking after her. * David Tennant is wonderfully brilliant as Kilgrave, someone Jessica is trying to avoid who is back from her past. * Jeri Hogarth is a lawyer who supplies Jessica with her detecting jobs, played by Carrie-Anne Moss who I must admit I haven’t seen since The Matrix (I know she’s done loads of films since!). * Wil Traval plays Will Simpson, a NYPD sergeant who stumbles into Jessica’s life after being sent to kill her best friend Trish. * Susie Abromeit plays Pam who is Jeri’s assistant and also lover, even though Jeri is married. Tut tut. * Mike Colter plays Luke Cage, who has some pretty amazing super-hero skills of his own. * Hope Shlottman, played by Erin Moriarty, is someone Jessica has been tasked with locating after she goes missing. IMDb synopsis: A small business owner is about to lose her shop to a major corporate development. My verdict: Wow. I spent much of the film shouting “no!” in various levels of pitch and I kind of felt like I wanted to watch this through my fingers. 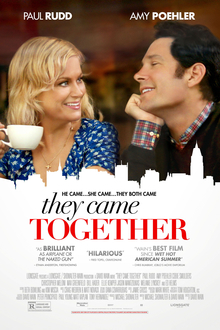 We recently watched the Michael Showalter/David Wain genius that is Wet Hot American Summer, and having loved it so as we had, we decided to watch They Came Together next, which is also a Showalter/Wain film. Paul Rudd plays Joel, a ‘corporate drone’ who works for a big sweet manufacturer, and Amy Poehler plays Molly, who runs a small independent sweetshop. One night, Joel and Molly are having dinner with Kyle (Bill Hader) and Karen (Ellie Kemper) and the discussion of how Joel and Molly met comes up. The film is basically them telling Kyle and Karen the rollercoaster story that is their life. It’s just hilarious. And hard to watch. And cringe-worthy. Because basically, this film is a spoof of pretty much any rom-com, chick flick, romantically clichéd film you may have seen. Nothing is sacred; the scene with Joel and his Bubby made me actually shout, “noooooooooooo!” at the screen. As Lt. Joe Kenda says, ‘my, my, my’. If you go to watch this, knowing it’s a spoof, you can’t go wrong. Reviews where people are complaining because it’s too silly, or they “don’t get it”, well, I don’t understand them because I loved it. But then, I loved Wet Hot American Summer too, and it’s just as epic. In 1981, Camp Firewood, a summer camp located near Waterville, Maine, is preparing for its last day of camp. Counselors have one last chance to have a romantic encounter with another person at Camp Firewood. The summer culminates in a talent show. Beth (Janeane Garofalo), the camp director, struggles to keep her counselors in order – and her campers alive – while falling in love with Henry (David Hyde Pierce), an astrophysics associate professor at Colby College. Henry has to devise a plan to save the camp from a piece of NASA’s Skylab, which is falling to Earth. Coop (Michael Showalter) has a crush on Katie (Marguerite Moreau), his fellow counselor, but has to pry her away from her rebellious, obnoxious, and obviously unfaithful boyfriend, Andy (Paul Rudd). Only Gene (Christopher Meloni), the shell-shocked Vietnam war veteran and camp chef, can help Coop win Katie—with some help from a talking can of vegetables (voiced by H. Jon Benjamin). All the while, Gary (A.D. Miles), Gene’s unfortunately chosen apprentice, and J.J. (Zak Orth) attempt to figure out why McKinley (Michael Ian Black) hasn’t been with a woman, the reason being that McKinley is in love with Ben (Bradley Cooper), whom he marries in a ceremony by the lake; Victor (Ken Marino) attempts to lose his virginity with the resident loose-girl Abby (Marisa Ryan); and Susie (Amy Poehler) and Ben attempt to produce and choreograph the greatest talent show Camp Firewood has ever seen. It really is a funny film, and I highly recommend you watch it! This eight-episode Netflix series is a prequel to the original film, and so really I would recommend watching the film first. The series is set on the first day of camp, and so (if you’ve watched the film first), a lot of things will start to make sense. Like, how did Gail end up with Ron? How did Katie get to together with Andy? Why is there a talking tin can in the film? All these answers, and more! As well as all of the original cast, there are a number of famous faces who pop up: Chris Pine, John Hamm, Kristen Wiig, Josh Charles, Lake Bell, Michael Cera, Jayma Mays and even “Weird Al” Yankovic. This is a behind the scenes view of the making of the 2001 film, when Michael Showalter (one of the writers) and David Wain (the other writer and director) try to make a film set on one sunny day in camp, when in fact the elements are against them and they had nothing but driving rain and muddy conditions. After watching the film and the series, it is a perfect way to round off your Netflix binge watch. IMDb synopsis: A young man’s recently deceased girlfriend mysteriously returns from the dead, but he slowly realizes she is not the way he remembered her. 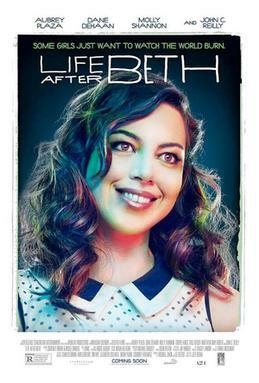 My verdict: I saw the trailer for Life After Beth a long time ago and I couldn’t wait to watch it. Then I read other people’s reviews and most people seemed to pan it, which was disappointing. I noticed it was on Netflix and decided to give it a go. I have to say that I did like it, but it was slow in parts and there was, as usual in films about zombies, no explanation for how the people came to be zombies. I think Aubrey Plaza is great in anything she’s in, and I have always been a big fan of John C. Reilly’s, so I would have watched it until the end no matter what. It’s a funny film and I’m glad that I watched it, but I wouldn’t rush to watch it again. IMDb synopsis: Detective Sherlock Holmes and his stalwart partner Watson engage in a battle of wits and brawn with a nemesis whose plot is a threat to all of England. My verdict: I must admit that before meeting my husband Michael, I hadn’t actually watched any Sherlock Holmes films. He has since introduced me to Robert Stephens’ The Private Life of Sherlock Holmes (1970) and Christopher Plummer’s Murder by Decree (1979). 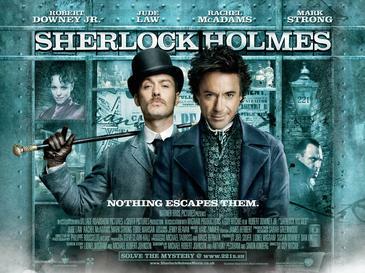 I loved both of those films so I was really excited to watch Guy Ritchie’s Sherlock Holmes film. I’m a big fan of Robert Downey, Jr., ever since I saw him in Weird Science (1985). I loved this version of Sherlock Holmes, and I was pleased to see Eddie Marsan was also in it who I love watching.